Samsung is slowly catching up to its competition in the contactless mobile payments market in the United Kingdom, with the South Korean electronics giant launching Samsung Pay in the country on Tuesday, one year after Android Pay arrived in the UK, and almost two years after Apple Pay launched in the market. Only three banks will be supporting Samsung Pay at launch, according to Bloomberg, with Santander, MBNA, and Nationwide cards working on the system at first, though American Express, First Direct, and HSBC are expected to join the roster in the coming weeks. Samsung UK head of technology, content, and launch management Kyle Brown said "We're working with every banking partner in the UK, so we're bringing on new banks very shortly." Samsung Pay is a similar system to Apple Pay and Android Pay, in that it allows users to make contactless payments using NFC, using card details provided by the user. Samsung's system differs in adding the ability to support a second wireless technology that can mimic a magnetic card swipe, a feature that allowed it to be accepted at some retailers that did not have a terminal capable of taking contactless payments. It is unclear if this extra feature will be offered to users in the United Kingdom, as the country has largely moved away from using magnetic strips, in favor of Chip and Pin payments. Contactless payments have also been adopted by the population, with over 100 million contactless cards currently in circulation in the country, excluding mobile-based payments. Another difference between Samsung Pay and its rivals relates to payment authorization, with owners of the Samsung Galaxy S8 able to scan their iris for authentication instead of using their fingerprint. Notably, a deal with Transport for London allows Samsung Pay users to complete payments for travel in the UK capital without authentication, theoretically letting passengers go through gates and turnstiles quicker. 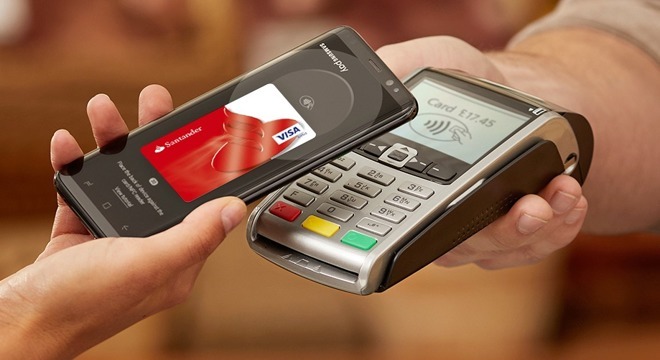 Samsung originally brought out Samsung Pay in South Korea and the United States in 2015, before rolling it out to China, India, Brazil, Spain, Russia, Thailand, Malaysia, Sweden, and the United Arab Emirates. The relatively slow rollout has allowed Apple Pay and Android Pay to embed themselves into the UK, making it much harder for Samsung Pay to get a foothold in the market. Samsung Pay's chances of acceptance are also reduced due to the payment platform being restricted only to Samsung devices, including the Galaxy S8, S8+, S7, S6, and edge variant smartphones, with the Gear smartwatches expected to include support in the near future. Notably, Samsung has apparently tried to bring Samsung Pay to iOS, but Apple reportedly rejected the Pay Mini app from the App Store late last year.